On Saturday 13th July, when you come along to Hand in Hand – our 30th anniversary festival, you won’t just be watching us Pinkies! We’ll be joined by a whole host of other LGBT choirs from around the country. Not got your ticket yet? Buy yours now! From Belfast we fly back over the water to the Leicestershire Rainbow Voices! 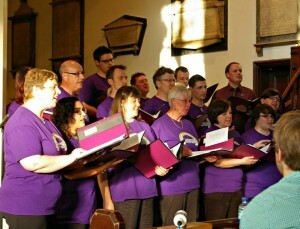 “Leicestershire Rainbow Voices was formed in November 2009 to bring together the LGBT community, their friends, family and supporters to share in a mutual love of singing and performing. As a choir, we embrace and celebrate our diversity through song and believe that our strength is found in our growing membership that now encompasses 24 members from all walks of life. The choir is proud to be in the safe hands of our Musical Director, William Northmore, who has been with the group since day one and provides us with valuable musical knowledge. We welcome members from all musical backgrounds and provide an opportunity for individuals to develop their skills in singing and performing, and offer a social platform for choir members and supporters to interact. We have an active management committee whose aim is to support and encourage the development of the choir and its members. In the past 12 months, we have gone from strength to strength and performed at various events that support the causes of the LGBT community and in May 2012 we hosted our first solo concert in the city of Leicester. And from Leicestershire we venture towards East Anglia! 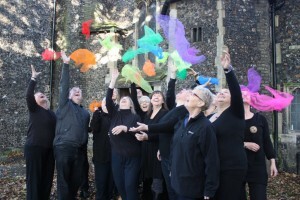 Sing With Pride Norwich are a choir from the LGBT community for everyone. 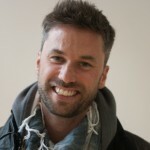 They rehearse on Thursdays from 7-9pm in Norwich city centre.